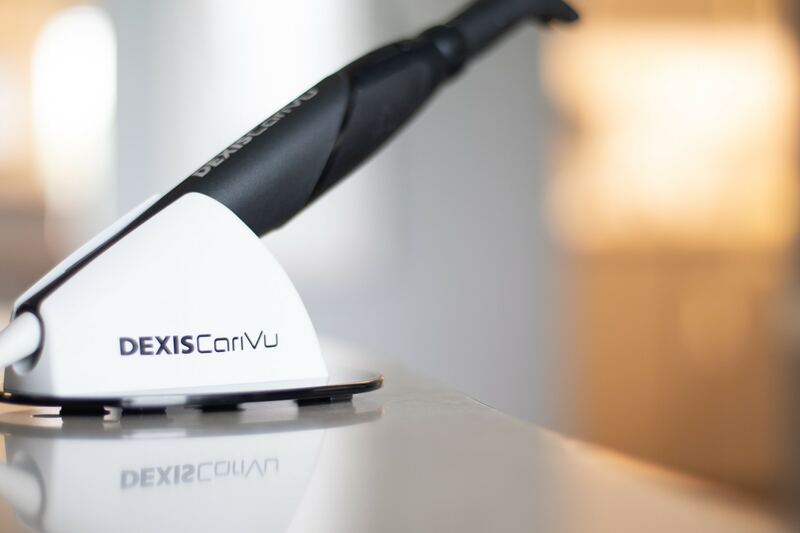 We use the DEXIS CariVu caries detection device to find hidden tooth decay (caries) and discover cracks that have formed in your teeth. Dental x-rays are helpful in diagnosing these issues but the CariVu device uses non-ionizing radiation so it is completely safe! The CariVu device uses completely safe, near-infrared light to illuminate a tooth. Under near-infrared light, healthy tooth enamel appears translucent, allowing us to “see through” your tooth. Areas of decay or damage trap the near-infrared light, and create visible densities that enable us to correctly diagnose hidden damage or disease. The CariVu device is easy to use, which means that we can incorporate it into a standard hygiene appointment. There is no pain associated with the device, and it captures images, which become part of your dental record. The images look like a dental x-ray. We can also use CariVu in place of dental x-rays. Some patients prefer not to be exposed to any amount of radiation, no matter how small. Because CariVu does not use radiation to evaluate a tooth, it offers an exceptional alternative to dental x-rays. CariVu is used in conjunction with dental x-rays to diagnose early-stage cavities and cavities between teeth.